This 1,234 sq. 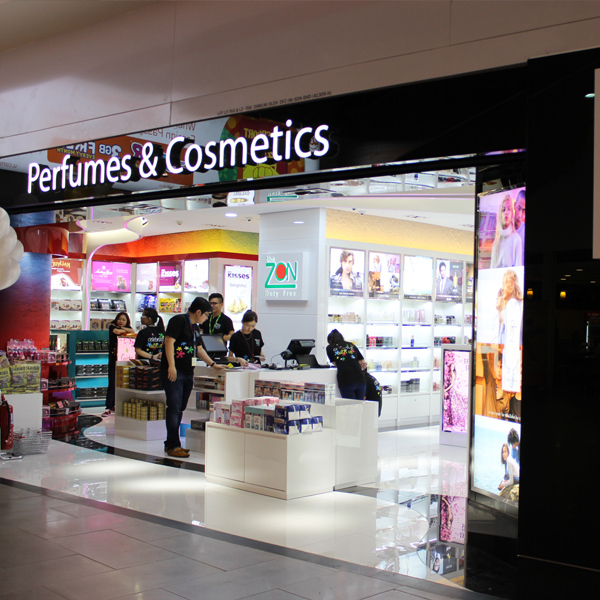 ft. outlet represents a new retail format for The ZON Duty Free, centred on chocolates and perfume while continuing to deliver accessible indulgence of extensive range of cutting edge perfume brands, cosmetics and wide selection of imported chocolates at great prices! This new outlet is inviting and easy for you to navigate. Following the flow of the walkway leads you into the beauty area where The ZON Duty Free has introduced brands such as Chloe and John Varvatos to the terminal. Here, you can choose from a wide range of the latest beauty products, from high-profile fragrance launches to premium skincare brands. At the center of the new store you will find an enticing new chocolates and confectionery area that showcases a selection of imported produce and family favorites. Chocolate brands such as Brookside, Duc d’O, and Kinder enable you to take a taste of your trip with them. Come and shop with us. We welcome you and are happy to serve you.